Purpose: To evaluate patient satisfaction, oral health-related quality of life, and patients' preferences towards minimally invasive treatment options for graftless rehabilitation of complete edentulism by means of dental implants. Material and methods: A MEDLINE search of literature in the English language up to the year 2013 was performed to summarise current evidence from the patient's perspective. The final selection included 37 studies reporting on minimally invasive implant treatment of 648 edentulous maxillae and 791 edentulous mandibles in 1328 patients, via a total of 5766 implants. Results: Patient satisfaction averaged 91% with flapless implant placement (range: 77 to 100%), 89% with short implants, 87% with narrow-diameter implants (range: 80 to 93%), 90% with a reduced number of implants (range: 77 to 100%), 94% with tilted implant placement (range: 58 to 100%), and 83% with zygomatic fixtures (range: 50 to 97%). Indirect comparison yielded patient preference towards tilted implant placement compared to a reduced number of implants (P = 0.036), as well as to zygomatic implants (P = 0.001). Conclusions: While little evidence on patients' preferences towards minimally invasive treatment alternatives vs. bone augmentation surgery could be identified from within-study comparison, it may be concluded that patient satisfaction with graftless solutions for implant rehabilitation of completely edentulous jaws is generally high. Comparative effectiveness research is needed to substantiate their positive appeal to potential implant patients and possible reduction of the indication span for invasive bone graft surgery. Conflict-of-interest notification: The authors declare that they have no conflict of interest. A proper definition of the 'optimal' number of implants to support a full arch prosthesis should go beyond solely a listing of the number of implants used in a treatment plan; it should be based upon a biomechanical analysis that takes into account several factors: the locations of the implants in the jaw; the quality and quantity of bone into which they are placed; the loads (forces and moments) that develop on the implants; the magnitudes of stress and strain that develop in the interfacial bone as well as in the implants and prosthesis; and the relationship of the stresses and strains to limits for the materials involved. Overall, determining an 'optimal' number of implants to use in a patient is a biomechanical design problem. This paper discusses some of the approaches that are already available to aid biomechanically focused clinical treatment planning. A number of examples are presented to illustrate how relatively simple biomechanical analyses - e.g. the Skalak model - as well as more complex analyses (e.g. finite element modelling) can be used to assess the pros and cons of various arrangements of implants to support fullarch prostheses. Some of the examples considered include the use of 4 rather than 6 implants to span the same arc-length in a jaw, and the pros and cons of using tilted implants as in the 'all-on-4' approach. In evaluating the accuracy of the various biomechanical analyses, it is clear that our current prediction methods are not always perfectly accurate in vivo, although they can provide a reasonably approximate analysis of a treatment plan in many situations. In the current era of cone beam computerised tomography (CT) scans of patients in the dental office, there is significant promise for finite element analyses (FEA) based on anatomically-accurate input data. However, at the same time it has to be recognised that effective use of FEA software requires a reasonable engineering background, especially insofar as interpretations of the clinical significance of stresses and strains in bone and prosthetic materials. Conflict-of-interest statement: The author declares that he has no conflict of interest. Background and aim: So far there is little evidence from randomised clinical trials (RCT) or systematic reviews on the preferred or best number of implants to be used for the support of a fixed prosthesis in the edentulous maxilla or mandible, and no consensus has been reached. Therefore, we reviewed articles published in the past 30 years that reported on treatment outcomes for implant-supported fixed prostheses, including survival of implants and survival of prostheses after a minimum observation period of 1 year. Material and methods: MEDLINE and EMBASE were searched to identify eligible studies. Short and long-term clinical studies were included with prospective and retrospective study designs to see if relevant information could be obtained on the number of implants related to the prosthetic technique. Articles reporting on implant placement combined with advanced surgical techniques such as sinus floor elevation (SFE) or extensive grafting were excluded. Two reviewers extracted the data independently. Results: A primary search was broken down to 222 articles. Out of these, 29 studies comprising 26 datasets fulfilled the inclusion criteria. From all studies, the number of planned and placed implants was available. With two exceptions, no RCTs were found, and these two studies did not compare different numbers of implants per prosthesis. Eight studies were retrospective; all the others were prospective. Fourteen studies calculated cumulative survival rates for 5 and more years. From these data, the average survival rate was between 90% and 100%. The analysis of the selected articles revealed a clear tendency to plan 4 to 6 implants per prosthesis. For supporting a cross-arch fixed prosthesis in the maxilla, the variation is slightly greater. Conclusions: In spite of a dispersion of results, similar outcomes are reported with regard to survival and number of implants per jaw. Since the 1990s, it was proven that there is no need to install as many implants as possible in the available jawbone. The overwhelming majority of articles dealing with standard surgical procedures to rehabilitate edentulous jaws uses 4 to 6 implants. Background: Full fixed prosthesis on a limited number of implants (FFP) are a viable treatment option for edentulous patients with a reduced amount of residual bone. Jaw muscular function in FFP patients has been evaluated in several studies, however heterogeneous data emerge from literature. Purpose: The aim of this review of the literature was to assess the function of jaw muscles in edentulous patients restored with full fixed prostheses on a limited number (≤ 6) of implants, as compared to dentate subjects and edentulous subjects wearing dentures, implant-supported overdentures or full fixed prostheses supported by more than six implants. Materials and methods: An electronic search of databases up to December 2013 was performed. The articles were selected using specific inclusion criteria, independent of the study design. Results: A total of 1598 records were identified. After removing the duplicates and excluding records based on title and abstract, only 37 eligible records were identified. After full-text review, seventeen studies were selected for analysis according to the inclusion criteria. From the included studies, only one evaluated masseter muscle thickness in a cross sectional study by means of ultrasound, while the 16 remaining papers evaluated muscular function by using electromyography (EMG). Those studies analysed several heterogeneous parameters throughout the execution of five functional tests and were therefore described and pooled according to the following task categories: clenching; swallowing; reflex and fatigue for statics; and chewing for dynamics. Conclusions: The results of selected studies seem to indicate that, compared to dentate controls, FFP patients display a global satisfactory neuromuscular equilibrium in static activities, but still have some impairment during chewing. Aims: The use of tilted implants has recently gained popularity as a feasible option for the treatment of edentulous jaws by means of implant-supported rehabilitations without recurring to grafting procedures. The aim of this review was to compare the crestal bone level change around axially placed vs. tilted implants supporting fixed prosthetic reconstructions for the rehabilitation of partially and fully edentulous jaws, after at least 1 year of function. Materials and methods: An electronic search of databases plus a hand search on the most relevant journals up to January 2014 was performed. The articles were selected using specific inclusion criteria, independent of the study design. Data on marginal bone loss and implant survival were extracted from included articles and statistically analysed to investigate the effect of implant tilting, location, prosthesis type, loading mode and study design. The difference in crestal bone level change around axial vs. tilted implants was analysed using meta-analysis. Results: The literature search yielded 758 articles. A first screening based on titles and abstracts identified 62 eligible studies. After a full-text review, 19 articles (14 prospective and five retrospective studies) were selected for analysis. A total of 670 patients have been rehabilitated with 716 prostheses (415 in the maxilla, 301 in the mandible), supported by a total of 1494 axial and 1338 tilted implants. Periimplant crestal bone loss after 1 year of function ranged from 0.43 to 1.13 mm for axial implants and from 0.34 to 1.14 mm for tilted implants. In spite of a trend for a lower bone loss around axial implants with respect to tilted ones at 12 months, as well as after 3 or more years of function, no significant difference could be found (P = 0.09 and P = 0.30, respectively). The location (maxilla vs. mandible), the loading mode (immediate vs. delayed), the restoration type (full vs. partial prosthesis) and the study design (prospective vs. retrospective) had no significant effect on marginal bone loss. Forty-six implants (18 axial and 28 tilted) failed in 38 patients within the first year of function. All failures except five occurred in the maxilla. After 12 months of loading, the survival rate of implants placed in the maxilla (97.4%) was significantly lower as compared to the mandible (99.6%). No prosthesis failure was reported. Conclusions: Tilting of the implants does not induce significant alteration in crestal bone level change as compared to conventional axial placement after 1 year of function. The trend seems to be unchanged over time even though the amount of long-term data is still scarce. The use of tilted implants to support fixed partial and full-arch prostheses for the rehabilitation of edentulous jaws can be considered a predictable technique, with an excellent prognosis in the short and mid-term. Further long-term trials, possibly randomised, are needed to determine the efficacy of this surgical approach and the remodelling pattern of marginal bone in the long term. A systematic review of implant-supported overdentures in the edentulous maxilla, compared to the mandible: How many implants? Background and aim: There is now overwhelming evidence from systematic reviews that a twoimplant overdenture is the first choice of treatment for the edentulous mandible. Conversely, consensus is lacking for implant-supported maxillary overdentures. 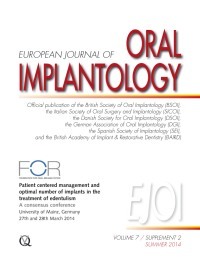 Therefore, we systematically reviewed the treatment outcome of concepts used for implant-supported maxillary overdentures, focusing on the survival of implants, survival of maxillary overdentures and condition of the implant surrounding hard and soft tissues after a mean observation period of at least 1 year. Material and methods: MEDLINE (1950 to December 2013), EMBASE (1966 to December 2013) and CENTRAL (1800 to December 2013) were searched to identify eligible studies. Two reviewers independently assessed the articles using specific study design-related quality assessment forms. Results: Out of 195 primarily selected articles, 24 studies fulfilled the inclusion criteria. A metaanalysis showed an implant survival rate of 98.1% and overdenture survival of 99.5% per year in the case of ≥ 6 implants and a splinted (bar) anchorage. In the case of ≤ 4 implants and a splinted (bar) anchorage, implant survival rate and overdenture survival were 97.0% and 96.9% per year, respectively. In the case of ≤ 4 implants and a non-splinted anchorage (ball, locator, telescopic crown), implant survival rate and overdenture survival were 88.9% and 98.8% per year, respectively. The condition of the peri-implant tissues was not reported in most studies. Conclusions: An implant-supported maxillary overdenture (all studies ≥ 4 implants) provided with a splinted anchorage is accompanied with a high implant and overdenture survival rate (both >95% per year), while there is an increased risk of implant loss when ≤ 4 implants with a non-splinted anchorage are used. Conflict-of-interest statement: None declared. Funding: The study was funded by the authors' university department. Nkenke, Emeka / Neukam, Friedrich W.
Aim: To analyse the morbidity arising from autogenous bone graft harvesting, graft resorption and implant survival in grafted sites. Materials and methods: Only comparative clinical trials on the harvest of autogenous bone grafts were selected. Studies were excluded if they compared autogenous bone grafts to bone substitutes or vascularised free bone grafts. Results: A total of 24 studies were included in the review. Six intraoral or distant donor sites were identified. The highest level of evidence was reached by a randomised controlled trial. The mandibular ramus was the source of bone that was preferred by the patients. From this intraoral donor site bone was harvested under local anaesthesia on an outpatient basis. Patients' acceptance of chin bone harvesting was low. It led to a considerable morbidity that included pain, superficial skin sensitivity disorders and wound healing problems at the donor site. Patients even preferred iliac crest bone harvesting over bone harvesting from the chin, although this distant donor site required general anaesthesia and a hospital stay. The harvest of posterior iliac crest block led to less morbidity than the harvest of anterior iliac crest block grafts. When only cancellous bone was needed, percutaneous bone harvesting from the iliac crest led to less morbidity than an open approach to the iliac crest. Conclusions: Dependent on the required graft structure and amount of bone needed, ramus grafts, block bone grafts from the posterior iliac crest and cancellous bone grafts harvested with a trephine from the anterior iliac crest should be chosen. Aims: Bone substitute materials (BSM) are described as a reasonable alternative to autologous bone (AB) to simplify the grafting procedure. In a systematic review and meta-analysis, the influence of BSM compared to AB on treatment success in augmentation procedures of the edentulous jaw was analysed. Material and methods: Literature analysis resulted in only two studies addressing reconstruction of the totally edentulous jaw using BSM. Therefore the literature analysis was extended to partially and totally edentulous jaws. The following augmentation procedures were analysed: maxillary sinus floor augmentation (MSFA) and vertical and/or lateral alveolar ridge augmentation; guided bone regeneration (minor and contained defects) were excluded. Meta-analysis was implemented using the literature from the years 2000 to early 2014 and only studies with a mean follow-up of at least 10 months were included. Results: After screening 843 abstracts from the electronic database, 52 studies in qualitative and 14 in quantitative synthesis were included. In studies examining MSFA, the mean implant survival rate was 98.6% ± 2.6 for BSM, 88.6 ± 4.1% for BSM mixed with AB and 97.4 ± 2.2% for AB alone. For MSFA, meta-analysis showed a trend towards a higher implant survival when using BSM compared to AB, however the difference was not statistically significant ([OR], 0.59; [CI], 0.33-1.03). No statistically significant difference in implant survival for MSFA between BSM mixed with AB and AB was seen ([OR], 0.84; [CI], 0.5-1.42). Concerning ridge augmentation, the mean implant survival rate was 97.4 ± 2.5% for BSM, 100 ± 0% for BSM mixed with AB and 98.6 ± 2.9% for AB alone. Metaanalysis revealed no statistically significant difference in implant survival for ridge augmentation using BSM or AB ([OR], 1.85; [CI], 0.38 to 8.94). For BSM mixed with AB versus AB alone, a meta-analysis was not possible due to missing data. Conclusions: Within the limitation of the meta-analytical approach taken, implant survival seems to be independent of the biomaterial used in MSFA and alveolar ridge augmentation. Therefore, based on the current literature, there is no evidence that AB is superior to BSM. The conclusions are limited by the fact that influence of defect size, augmented volume and regenerative capacity of the defects is not well described in the respective literature. Conflict of interest statement: There are no commercial or other associations that might create a duality of interests in connection with the article.